Here I am 50 hours away from the year 2018. As I reflect back over seven decades there have been incredible peaks and craters to cross. The ultimate crater was Rebecca's choosing to end her life. Yea, why am I still here? I ask myself that question frequently. Only one out of 20 survive sudden cardiac arrest. Thank you, Johnny, for being there in the wee hours of May. I hope I can still see you each May 15th. Williamson County Hospital does not make it easy. Thru it all I feel blessed. In the past dozen years, my best decision was to relocate to be near my son, Michael's family. Nothing quite like being a part of three birth children and two adopted children make it to the teenage years. I constantly tell grandparents there is a huge difference between knowing your grandchildren and just knowing about them. I would only have known about them had I stayed in Missouri. Relocating does have a significant downside. Most of my friends back in St. Louis have slowly faded away. Just the natural result of no face to face visits. Yea, I know technology has a solution for that but I think "it is NOT the same." It has not been all doom and gloom. 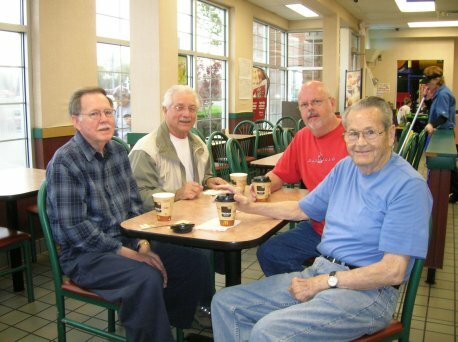 I roamed the neighborhood met and invited three for coffee at MacDonald’s. From there I established the Castle Coffee Club (four of us) that met every weekday morning at my house for almost three years. A few rules (like no shoes) made cleanup easy. Then only one person talks at a time made for a fun, meaningful time and bonded us in a deep way. You learn a lot about each other in an hour and a half, five days a week. We stayed to ourselves for several years till a neighbor lady insisted we invite another fellow she knew. So after those great years, we opened it up and the crowd grew, the cleanup became a job and the closeness dissolved. I backed away because it just was not meaningful Now almost a decade later probably a dozen or so continue to meet at a MacDonald's once a week. I attend occasionally but it is not the same. Now it is much like going to church, you see folks you like and in some cases love but you never get deeper than "hi how are you." Afterwards, you go your own way only to repeat the same shallow exchange a week later. As I have aged I realize how much work it is to be real friends. Friends on Facebook are way too imaginary to me. For whatever reason, I am only satisfied with face to face encounters. Maybe I am becoming a grouchy old man?